To celebrate my 40th post on this blog, I'm gonna blog about one of my favorite things in England, which is cake. I'm pretty sure I loved cake before I arrived in this country, but living here has exponentially increased my fervor for cake. Maybe it's because I've had three weeks of stuffing cupcakes in my face (for various reasons) or perhaps it's just because cake is tasty, calorific, delicious and brightens up everyone's day. I don't know anyone who isn't instantly cheered by a big wedge of cake placed in front of them, except for maybe my dad, who has had Type 2 diabetes for over 30 years and can't eat any sweets. Cake probably just makes him sad. But let's focus on the happy aspects of cake consumption today. This morning, my colleague Lindsey presented me with a piece of her wedding cake she had promised months earlier - yes, that's right, Lindsey's wedding was in early December and I'm sitting here enjoying a slice of her gorgeous, yummy cake with a cup of tea right this second. 'Did she freeze it?' I hear you ask. Nope. 'Isn't it stale and moldy?' Um, no. That's because Lindsey's cake is a fruit cake, which apparently is the traditional type of wedding cake in Britain (it's also traditional to have at Christmas). 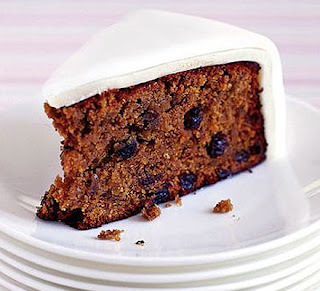 Soaked in alcohol and heavily iced with delicious icing and marzipan, fruit cake is fabulous because a) you can have a little slice and be full already b) it lasts, like, forever and c) it's super tasty and goes well with a cup of tea. Although fruit cake is also available in the States, it's not as common - we usually have a chocolate or vanilla sponge with matching icing. Or, if you visit Baskin Robbins, you can get an ice-cream cake, which I had for every single birthday probably from the age of 1 until I was about 12 (twelve is the cut-off for Baskin Robbins ice-cream cakes I think because that's about the age you start getting a little too old for the My-Little-Pony theme on top) which is basically ice-cream sandwiched between sponge. Delicious. Maybe I can have an ice-cream cake for my 27th this year. that is pretty exciting. As i START day 1 of a cake-free Lent, I have already been thinking about a lot of cake. My roomate made red velvet and chocolate fudge cake last night. But I do agree with you, the fruit cake that lasts forever, along with thick frosting, is indeed scrumptious. Here, cake life (especially boxed cake) has a yummy-life of about 4 days max and a half-life of 2 days. 'it probably just makes him sad' makes me laugh. sorry! good line. I know, it's sad and funny at the same time - he claims he's not affected positively or negatively by cake and shrugs his shoulders when I ask him if he misses it.